A team of UC Santa Cruz researchers working to find new drugs to fight cholera has won a $10,000 Award for Innovation sponsored by Deloitte and the California Institute for Quantitative Biosciences (QB3). 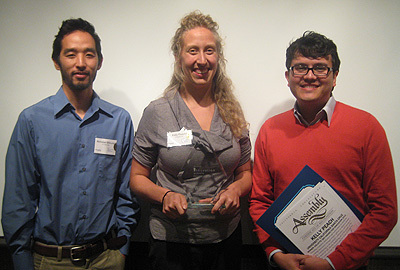 The UCSC team consists of Kelly Peach, a graduate student in chemistry and biochemistry; Nicholas Shikuma, a graduate student in microbiology and environmental toxicology; and Walter Bray, a research specialist in the UCSC Chemical Screening Center. They developed a screening procedure to identify compounds that can stop cholera bacteria from forming antibiotic-resistant biofilms. Many bacteria that cause infections and disease, including those that cause cholera, are known to form biofilms. These tough aggregates of bacteria are resistant to traditional antibacterial treatments and to attacks by the immune system. Although biofilms are involved in 60 percent of all human bacterial infections, there are no commercially available therapies for preventing biofilm formation. Peach, Shikuma, and Bray have developed the first high-throughput, image-based assay for cholera biofilm inhibitors. The assay, which can be performed in one day, streamlines the process of identifying inhibitors and will provide compounds that could be used as coatings for medical implants or as components of antibiotic cocktails. Peach works with Roger Linington, assistant professor of chemistry and biochemistry, whose research group focuses on marine microorganisms as a source of natural products for drug discovery efforts. Shikuma works with Fitnat Yildiz, associate professor of microbiology and environmental toxicology, whose research focuses on cholera bacteria and the role of biofilms in seasonal epidemics of cholera. Bray, who earned an M.S. in molecular, cell and developmental biology at UCSC, manages the operations of the Chemical Screening Center, where advanced robotic systems are used to search for biologically active compounds with potential for fighting diseases or other uses. QB3 is a consortium of three UC campuses that fosters collaborations among scientific faculty to enhance innovation and discovery. QB3 is collaborating with Deloitte in the institute's efforts to convert bioscience innovation into a driver for jobs, companies, and better health in California.